Our team trim some of the nicest hedges in Ottawa. We have all the proper equipment to trim, repair, or remove any size hedge. 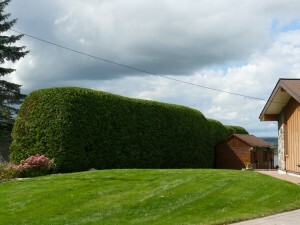 Not only does trimming highlight your landscape, it promotes new growth for thicker healthier hedge. The main thing when trimming hedges is to give them enough time to harden and prepare for winter. In spring, you want to trim your hedges before the bright, green, new growth matures. In fall, you want to trim your cedars before it has produced buds for next years growth. Trimming cedars after they have buds will force them to grow more rapidly. This depletes its energy reserve and will therefore enter winter in a weaken state. Hedges can be planted in early spring approx. 3-4 weeks after deciduous trees have opened their leaves or in the fall from August to the end of October. Hedge removal – We are able to cut any size hedge, chip all brush and grind 6-9 inches underground. Hedge planting – We have skilled people to ensure your hedge is planted correctly. We take the time to inspect each plant and make sure its planted using proper methods.